Here's something you probably would have never guessed about me... I used to be very into scrap booking. There I said it. But this was back in the days of Elmer's glue and scissors, before all this new fangled digital scrap booking came about. Sitting in my mother's garage in Texas, are scrapbook upon scrapbook from my teens and early twenties of photos and tickets stubs and wonderful memories of my misspent youth (The Husband will probably never see these any of these... two words... pink hair). Now that I'm here in France, an old married lady with my very own furbaby, it's time to start recording some new memories, but this time I'm stepping away from the glue and trying it digitally. 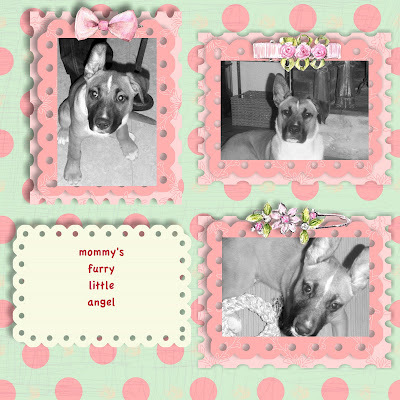 This is my (lame) attempt at digital scrap booking. In fairness, it was my very first time. I chose the baby girl memory layout because 1) Fifty is my child and 2) while he is not a girl, he really likes pink (but please don't tell him that I told you that, he would be sooooo embarrassed). But, even though mine is a C+ at best, I have a feeling that a lot of you reading this would definitely be gold star scrapbookers because hello... I've read your blogs, you pretty much have that whole, creative, artsy, etsy thing down, and My Memories wants one of you, to have your own scrapbook software for free. I love scrapbooking (the old-fashioned way) and have loads of books in Pittsburgh and a few in Paris that just get in Sir L's way. I also have boxes full of "moments" that still need scrapbooked. Did you like the digital experience? Not lame at all! Pale pink and grey is one of my favorite color combinations. The tooth tale is too cute. Although, I'd have no use for it right now. I mean, maybe one day if I have a little preshie. But I like you on FB, too! what if I win yours and you win mine...CRACKERS! I don't scrapbook so I don't want to enter and end up winning instead of someone who really does enjoy scrapbooking, but I have to say this. When can we all see pictures of this pink hair?! I had pink tips on my hair for a while when I was 15. I'll show you mine if you show me yours.. This giveaway is awesome!!! I miss scrapbooking here in France - all my supplies are at home. I hope I'm looking at the site correctly, but I think my favorite is "Once Upon a Time". I'll say "Endless Love Mask"